Catsparella: From Pakistan To Princeton: Cat Ladies Unite! 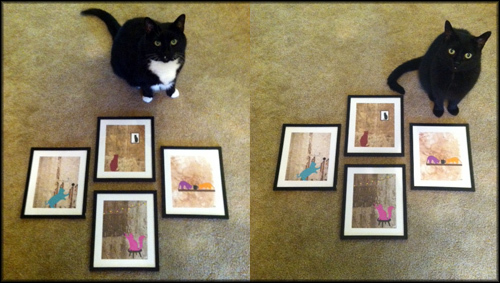 Priscilla and Charlie posing with our new art! Khizra lives in Pakistan and is the Creative Director at Sharmeen Obaid Chinoy Films. I live in Princeton, New Jersey, and blog about cats. She first contacted me a little over a year ago to share share a wonderful piece she wrote about being a "Crazy Cat Young Woman," and shortly after, contributed a Caturday post about her five kitties, Laddu, Bhondu, Rano, Laali, and Gabru (sadly, Gabru has since passed away). Despite being born and raised in different parts of the world, in very different cultures, it was ultimately a mutual admiration for felines that brought us both together. A few weeks ago, Khiz asked for my address to send me something, "obviously cat related." To my consternation (in the eternal words of Jay Z, "I got no passion, no patience, and I hate waiting"), she refused to spoil the surprise by providing any hints. I'd just have to wait for it to arrive, which it finally did on Friday. As I anxiously tore into the box (after carefully considering if there was anything alive inside), I was shocked to find four beautiful, digital kitty prints that Khizra created as part of an alumni exhibit. The gift was meaningful because she made it herself, but also because of the long journey it took from Pakistan to New Jersey, by way of my little cat blog. Every time I admire my awesome new art, I'll not only think about my friendship with Khizra, but also about much I treasure the wonderful connection I share with all of you because of our universal love for cats. Cats: the international language of understanding. Great prints! WOW BEAUTIFUL!!! How lovely all around! These prints are great! And I love that though people can be literally on the other side of the world, we are able to have such a simple, common bond with each other. What a wonderful surprise and beautiful artwork! What a beautiful surprise! Aren't the connections we make through our blogs the best? I (that would be Koko's mumzy) remember that post about her kitties. This brings a smile to my face on so many levels. Those are so pretty. Loved your post. I have many cat friends. Very beautiful and such a touching gift. Yay! Ive probably read this post like a dozen times, but I still cant get over it. Priscilla and Charlie look adorable, and now you cant complain that they never pose easily. They're totally doing what you want here. Thank you to everyone for your wonderful comments! Khizra: They were actually being surprisingly cooperative and came right over as soon as I put the prints down, however you will notice that they are both in separate pictures, as there's no way she would let him get close enough to her in one shot, HAHA. Thank you again for the awesome gift, and for spending your mornings with me :D TEAM INTERNET!! what a totally cool thing and the prints are really lovely...cats rock!